Vancouver, BC – Sabina Gold & Silver Corp (SBB.T), (“Sabina” or the “Company”) is pleased to announce additional results from the summer exploration diamond drilling program at its 100% owned Back River Gold Project in Nunavut Canada. 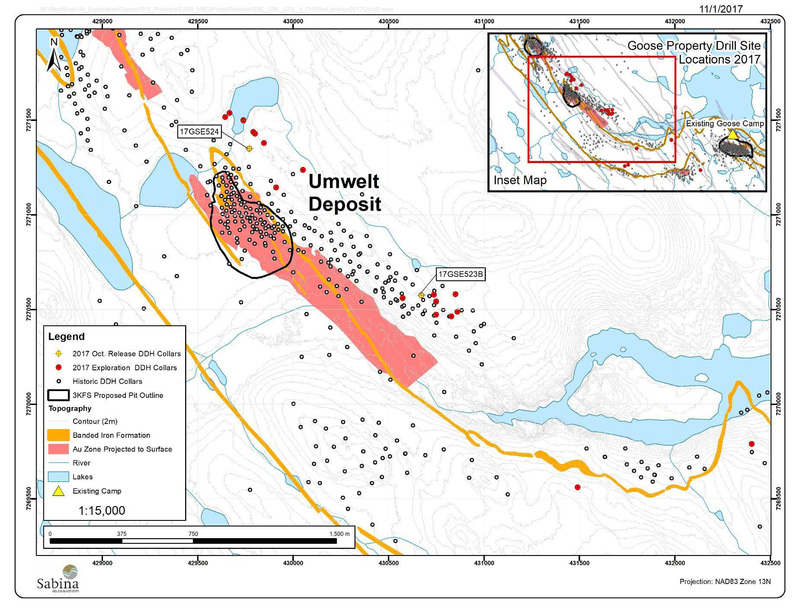 The Umwelt Vault target drilling has continued to successfully demonstrate the exceptional widths of high grade mineralization that are present within the zone. Drill hole 17GSE523B intersected 9.00g/t Au over 28.70m, testing a portion of the Vault approximately 150m up plunge from previously reported drill hole 17GSE517 which returned 5.99g/t Au over 33.25m (news release Oct 19, 2017). 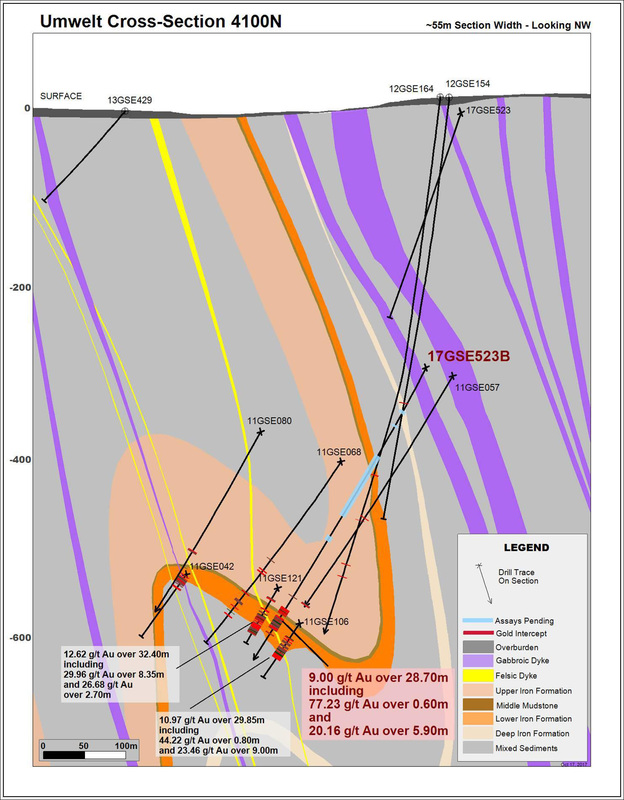 This drill hole was successful in providing further evidence of continuity of the high grade Vault zone with a demonstrated overall strike length of over 325m. See Figure 2, Umwelt cross-section. 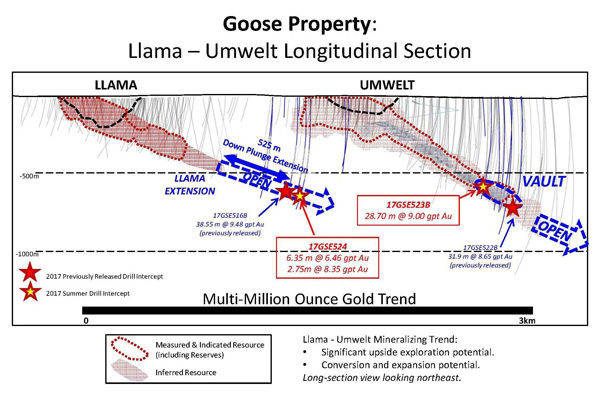 “Results from drilling continue to demonstrate the excellent potential for growth and project optionality at the existing deposits at the Goose property,” said Bruce McLeod, President and CEO. 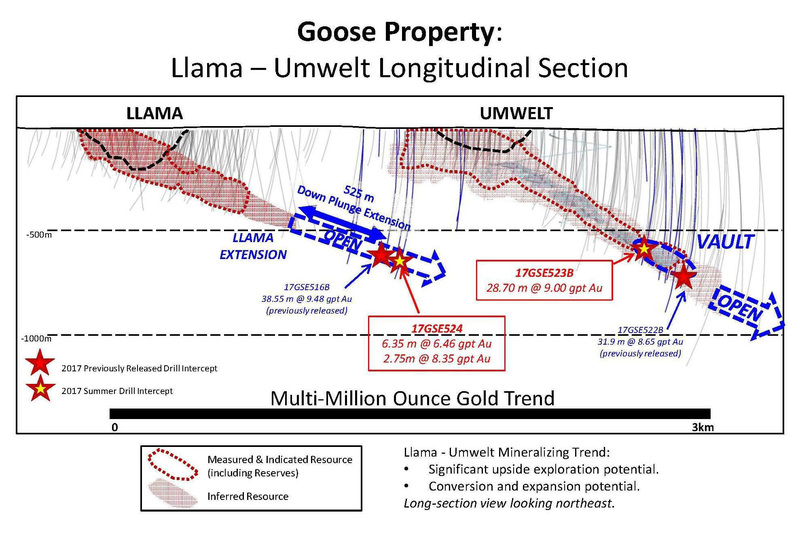 “This year’s results at the Vault zone and Llama extension demonstrate continued validation of targeting concepts and puts us in a strong position to continue to aggressively add value to the near and long term economics of the project. We look forward to applying our knowledge and experience going forward to create other opportunities for deposit extensions and potential new discoveries in the Back River belt. We believe that this will be a multi-generational mining district”. *True widths of the intervals are unknown at this time. 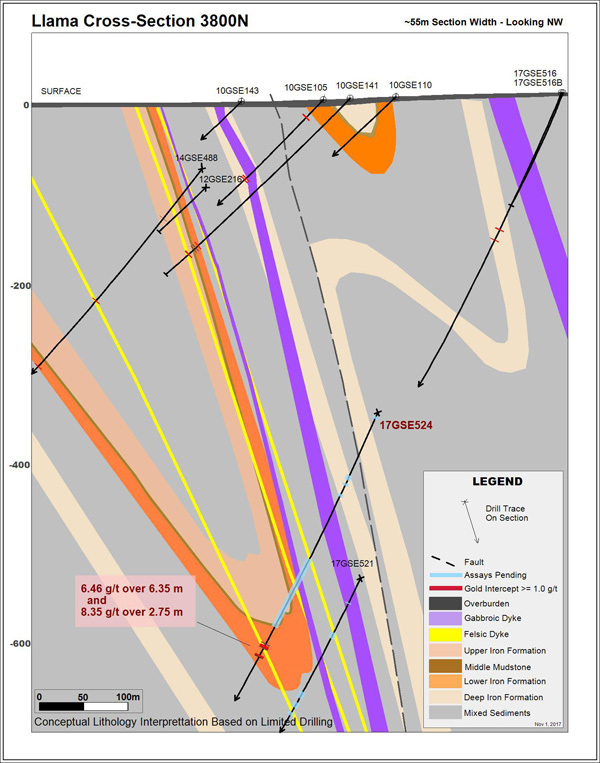 Drill hole 17GSE523B adds confidence in the continuity of the high grade Vault zone by intersecting the thickened lower iron formation along a mineralizing structural corridor. This strong intercept sits within moderately to strongly altered, folded banded-iron formation characteristic of the gold mineralization at the Umwelt deposit. Mineralization consists of up to 15% variably textured pyrrhotite with ~5% euhedral arsenopyrite. Visible gold occurs along sulphide grains, sulphide-bearing quartz veins and within altered iron formation. At the Llama Extension, drilling continues to intersect a tightly folded syncline within the Back River lower iron formation stratigraphy. This unit is identified as hosting the majority of the current resources at the Back River Project and is widely distributed across the Goose Property. Mineralization consists of significant arsenopyrite, pyrrhotite and visible gold that is associated with significant quartz veining and strong amphibole and chlorite alteration. 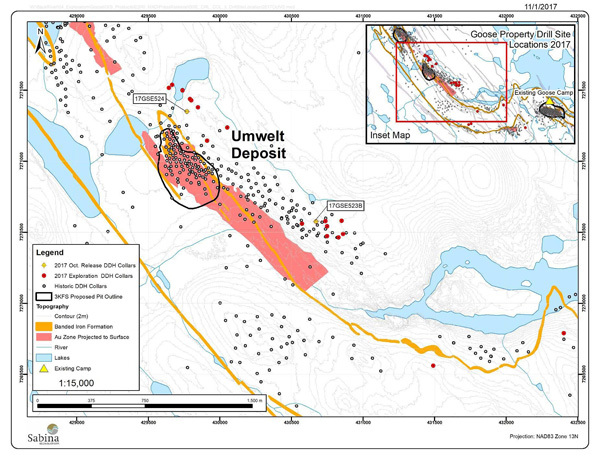 This intercept is located relatively parallel to the area vertically below the Umwelt deposit and remains a high exploration priority for further extension. This news release contains “forward-looking information” within the meaning of applicable securities laws (the “forward-looking statements”), including our belief as to the extent, results and timing of exploration programs and various studies including the FS, and exploration results, reserves estimates, potential production from and viability of the Company’s properties, production and operating costs and permitting submission, timing and receipt of necessary permits and project approvals for future operations and access to project funding. These forward-looking statements are made as of the date of this news release. Readers are cautioned not to place undue reliance on forward-looking statements, as there can be no assurance that the future circumstances, outcomes or results anticipated in or implied by such forward-looking statements will occur or that plans, intentions or expectations upon which the forward-looking statements are based will occur. While we have based these forward-looking statements on our expectations about future events as at the date that such statements were prepared, the statements are not a guarantee that such future events will occur and are subject to risks, uncertainties, assumptions and other factors which could cause events or outcomes to differ materially from those expressed or implied by such forward-looking statements. Such factors and assumptions include, among others, the effects of general economic conditions, commodity prices, changing foreign exchange rates and actions by government and regulatory authorities and misjudgments in the course of preparing forward-looking statements. In addition, there are known and unknown risk factors which could cause our actual results, performance or achievements to differ materially from any future results, performance or achievements expressed or implied by the forward-looking statements. Known risk factors include risks associated with exploration and project development; the need for additional financing; the calculation of mineral resources and reserves; operational risks associated with mining and mineral processing; fluctuations in metal prices; title matters; government regulation; obtaining and renewing necessary licences and permits; environmental liability and insurance; reliance on key personnel; the potential for conflicts of interest among certain of our officers or directors; the absence of dividends; currency fluctuations; labour disputes; competition; dilution; the volatility of the our common share price and volume; future sales of shares by existing shareholders; and other risks and uncertainties, including those relating to the Back River Project and general risks associated with the mineral exploration and development industry described in our Annual Information Form, financial statements and MD&A for the fiscal period ended December 31, 2016 filed with the Canadian Securities Administrators and available at www.sedar.com. Although we have attempted to identify important factors that could cause actual actions, events or results to differ materially from those described in forward-looking statements, there may be other factors that cause actions, events or results not to be as anticipated, estimated or intended. There can be no assurance that forward-looking statements will prove to be accurate, as actual results and future events could differ materially from those anticipated in such statements. Accordingly, readers should not place undue reliance on forward-looking statements. We are under no obligation to update or alter any forward-looking statements except as required under applicable securities laws. This news release has been authorized by the undersigned on behalf of Sabina Gold & Silver Corp.